Do I need to install drivers before installing SSD? In general speaking, if SSD supports SATA interface, the driver is built in Windows 7 & 10. No need to install any third-party driver. If SSD supports PCIe, an NVMe driver must be installed in Windows 7. Windows 10 has native driver for PCIe SSD. What the “S.M.A.R.T” is? How can I check the S.M.A.R.T of my SSD? How to keep the operating system and data in my original drive when I purchase a new solid-state drive? System cloning is the recommended way to transfer the operating system to SSD. It would keep all data, setting, drivers that needed for your computer. To clone your drive, Lexar recommends EaseUS Todo Backup as assistant, please visit https://www.easeus.com/to have more detail. What the “Garbage Collection” is? In SSD, lots of scattered data pieces will generate in use. The Garbage Collection (so called GC) mechanism is to move these pieces into specific physical units, and then to reuse the original units to store new data. Garbage Collection is necessary and results in overall performance of SSD. Lexar optimizes the algorithm for high efficient GC to ensure SSD works smoothly. What the “TRIM” is? What is the relationship between TRIM and Garbage Collection? TRIM is anOS (Operating System) command set, which was started supporting in Windows 7. When user deletes a file, OS sends TRIM to inform SSD about the operation, then SSD marks the specific storage units to invalid state. Once the GC operates, GC could be more precise and efficient to erase the storage unit without unnecessary reallocation of data in flash memory. M.2 is known as NGFF (Next Generation Form Factor), enables expansion, contraction, and higher integration of functions onto a single form factor specification. SSD is one of the devices adopts M.2, and it offers slim, compact sized to be flexible in different devices. Why my performance benchmark is different to the values expected? Testing values vary with different benchmark tools. The version of tools also have impact on testing result. How do I check if my computer is compatible to use M.2 PCIe SSD? M.2 slot may only support SATA protocol. Please contact the service center or visit the websites of your PC/laptop/motherboard manufacturerto realize the specification details before purchasing M.2 PCIe SSD. SSD has a mechanism, wear leveling. This mechanism ensure every single physical storage units get the same P/E cycle . It aims to extend the working life. Defragmentation is not required. UHS stands for “Ultra High Speed” and refers to the new technology that enables higher bus interface speeds on Secure Digital High Capacity (SDHC) and Secure Digital Extended Capacity (SDXC) cards. UHS-I defines interface speeds up to 104MB/sec. A SDHC or SDXC card that supports “UHS” could have performance up to 104MB/sec. UHS-II is new generation UHS，UHS-II improve the interface speeds up to 312MB /s，that is 3 times of UHS-I. What is the U1/U3 Speed Class? 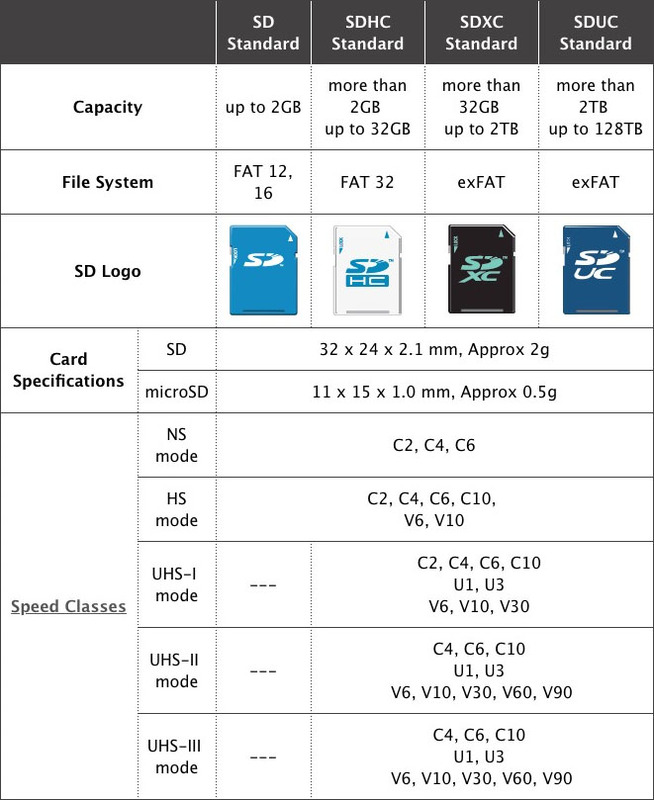 Some of the new UHS memory cards may have a U1 marking, which refers to the U1 Speed Class designed for UHS-I card. The U1 Speed Class designates a minimum capture (write) performance of 10Mbytes per second for recording streaming video content. Note that although U1 is the same speed as Speed Class 10, they are tested differently, and meeting one does not imply that the other is met by the card. U3 Speed Class means that the memory card performance need to reach 30MB/s to meet 4K resolution recording and play. What is the V30/V60/V90 Video Speed Class? 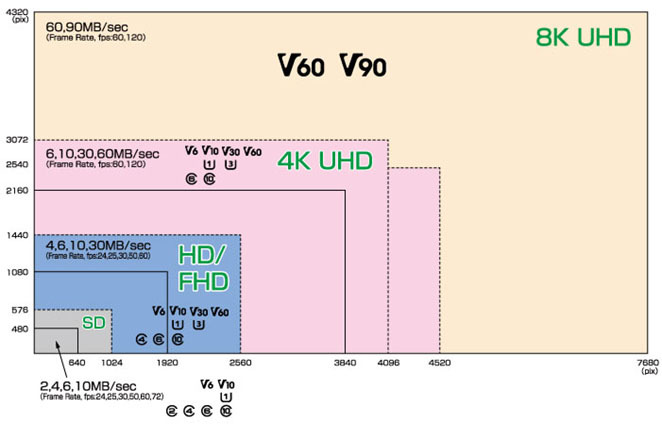 V60 and V90 can be applied to high resolution and high quality 8K video recording，and V6，V10 and V30 can be applied to 4K resolution. 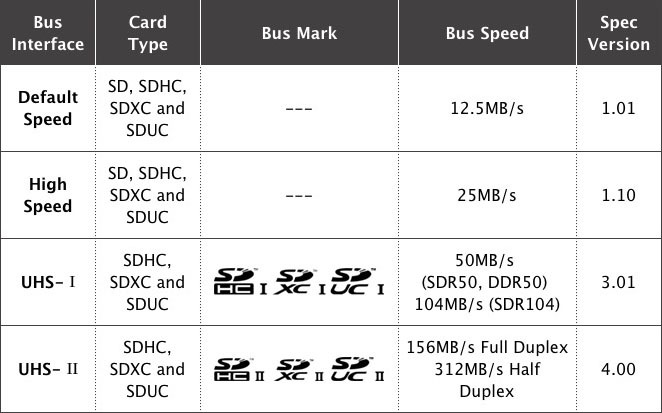 SD maker will print these speed class symbols on memory card(V60、V90…etc.). 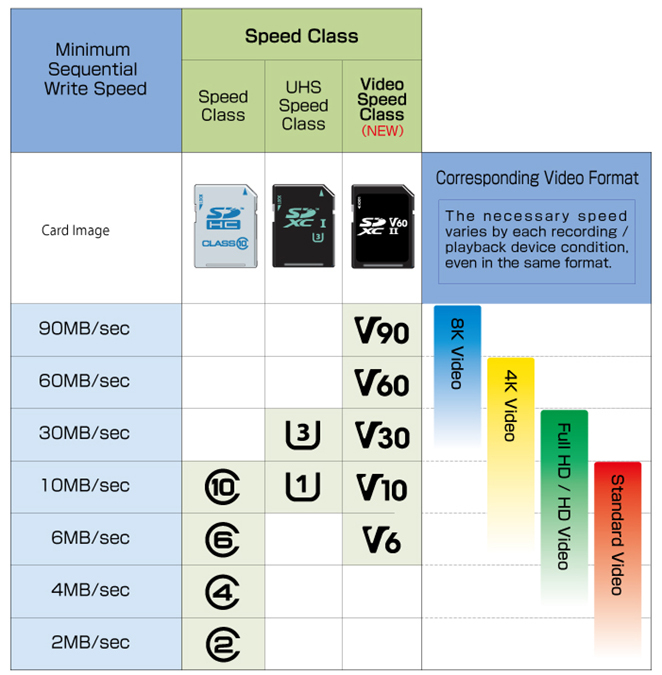 These speed class symbols will indicated to SDHC, SDXC UHS-I，UHS-I and SD memory card help users decide the best combination for reliable recording. What is A1/A2 application performance class? It is defined for smartphone application performance classification. 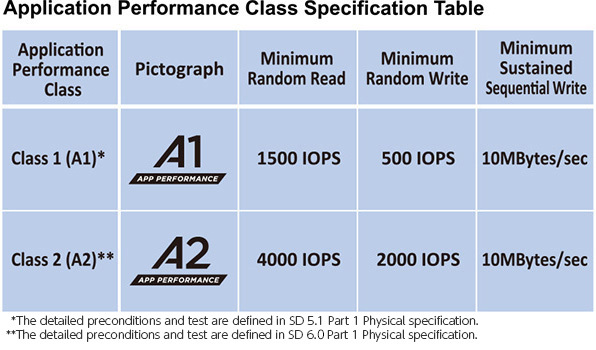 Application Performance Class 1 (A1) and Class 2 (A2) specification, the minimum average of random read/write IOPS. IOPS specification of A1 is read 1500IOPS /write 500IOPS，and the minimum sustained sequential performance is 10MB/s. IOPS specification of A2 is several times of A1. The random read is 4000IOPS，and the random write is 4000IOPS. That means the write performance of A2 is faster than A1 read performance, and the minimum sustained sequential performance is also 10MB/s. Please refer to Lexar compatibility list. 1. How do I check the In-App and External (USB) Storage usage? In-App or External Storage memory used (%) and memory availability are displayed at the top of the home screen. 2. What is In-App Storage and why doesn’t it display everything on my iPhone®/iPad®? In-App Storage is the memory partition within the Lexar® Mobile Manager app only, and doesn’t include all the files that you have saved on your iPhone/iPad. It doesn’t allow you to browse those files that are saved directly on your device – only those saved within the app. This restriction is set by Apple® iOS, not the app developer. 3. How do I access files on my In-App or External (USB) Storage? Tap the ‘In-App Storage’ or ‘External Storage’ icons at the top or in the main menu. This will access the relevant storage file manager. 4. Can I use the Lexar Mobile Manager app when no Lexar iOS-compatible product is connected? Yes, the Mobile Manager app can still function without an external drive connected, however the functionality involving external storage will not be available. When trying to use external storage features, you’ll see a pop-up window that says “Device not Connected”. External Storage on the home screen will show as N/A when no drive is connected. 1. How do I copy or move files from External Storage to In-App Storage and vice versa? Make sure your Lexar iOS compatible memory product is connected to your phone. Tap the ‘External Storage’ or ‘In-App Storage’ icon, depending on where the file is currently located. Tap ‘Select’ on the top right corner and select the file(s) to copy or move by tapping the button next to the file. Tap ‘Copy’ or ‘Move’ then select ‘In-App Storage’ or ‘External Storage’, depending where the files are to be copied/moved to. Select the file destination and tap ‘Copy here’ or ‘Move here’. 2. How do I copy videos from the Camera Roll or any accessible folders or albums on the device? Tap the ‘Video’ icon to enter the menu. Navigate to the folder containing the videos and tap ‘Select’ at the top right and then select the video(s) you want to copy. 3. How do I copy pictures from the Camera Roll or any accessible folders or albums on the device? Tap the ‘Photo’ icon to enter the menu. Navigate to the relevant folder or album within Camera Roll and tap ‘Select’ at the top right hand corner. Select the photo(s) you want to copy. 4. How do I copy or move videos or pictures to the Camera Roll from External Storage? Tap ‘External Storage’ from the home screen. Navigate to the file(s) you want to copy or move to the Camera Roll (limit of 20 files). Tap ‘Select’ and then select the videos or pictures you want to copy or move. 5. How do I rename a file in External Storage? Files in External Storage cannot be renamed within the app. They can be renamed on your computer. Connect your Lexar iOS-compatible product to the USB port of your Mac/PC and then rename the files as you normally would through your Operating System. You can also copy or move the file to In-App storage, and then follow the instructions for renaming a file in In-App Storage. 6. How do I rename a file in In-App Storage? From the home screen tap ‘In-App Storage,’ navigate to the file, tap ‘Select’ at the top right corner, and select file(s) you want to rename. Enter the new name and tap the checkmark to create the new name. 7. How do I create a new folder in External or In-App Storage? Go to the In-App Storage or External Storage menu. Enter the new folder name and tap the checkmark to create the folder. 8. How do I move a file to a folder? Navigate to the file you would like to move and select the file. Navigate to your desired destination folder, and select the folder. Tap ’move here‘ to move your file to this folder. 9. How do I create a new text file? Type the text in the text box, then click on the title to change the file name. Click the checkmark at the top right to save the text file. 10. How do I delete a single file? Find the file in the In-App Storage or External Storage menu. Slide from right to left on the file. Tap the red trash can icon to delete the file. 11. How do I delete multiple files? While in any category menu, tap ‘Select’ at the top right corner. 12. How do I enable Dropbox support in the Lexar Mobile Manager app? Dropbox will ask for permission to connect with the Lexar Mobile Manager app. Enter your Dropbox login details to allow access to your account via the Lexar Mobile Manager app. 13. How do I record a voice memo through the Lexar Mobile Manager app? Tap the ‘Recorder’ icon to open the voice recorder function. Within the voice recorder, tap the red ‘Recorder’ button to begin recording, and the stop button when complete. You can hear your recording by tapping the play button, and you can delete the recording by tapping the ’X‘ button. Tap ’Save’ in the upper right hand corner. The file will be saved to the list within the Recorder with the time stamp as the file name. 14. How do I attach files to an Email? 15. How do I save Email attachments to In-App Storage? Long press on the attachment in an email. Select ‘Import with Mobile Manager’ app to save to the root folder in In-App Storage. Choose ‘Print’ from the Share menu. 1. How do I play music or videos from External Storage ? Connect a Lexar iOS-compatible product to your Apple device. Tap the music or video icon to enter the relevant menu. Tap the arrow at the top to expand the menu. Choose ‘External Storage’ and tap any music or video file to start playing it. 2. How do I play music or videos from In-App Storage? Tap on any music or video file to start playing it. 3. How do I view pictures from External Storage? Tap the ‘Photo’ icon on the home screen. Choose ‘External Storage’ and tap any image file to view it. 4. How can I view my pictures from In-App Storage? Choose ‘In-App Storage’ and tap any image file to view it. 5. Can I play movies/TV shows bought from iTunes®? Movie files bought through iTunes are protected (Digital Rights Managed or DRM) files and are not accessable through third party software such as the Lexar Mobile Manager app. 1. How can I backup Contacts or Camera Roll to a Lexar iOS-compatible product? Tap the ‘Contact Backup’ or ‘Photo Backup’ icon to enter the relevant menu. Tap the ‘Backup’ button to start the backup. The time stamp will be displayed in ”Previous Backup” when the process is complete. 2. How do I restore Contacts or Camera Roll from a Lexar iOS-comatible product? Tap the ‘Restore’ button to enter the restore options. To restore Contacts, select the file you wish to restore from. To restore Camera Roll, select ‘Restore All Files’ or ‘Select file(s)’. The time stamp will be displayed in ”Previous Restore” when the process is complete. Note: Current Contacts will be replaced by the backup file. 3. How do I automatically backup Contacts/Camera Roll to a Lexar iOS-compatible product? Select the items to be automatically backed up when a Lexar iOS‑compatible product is connected to the iOS device. Contacts and/or Photos will then be automatically backed up whenever your Lexar iOS-compatible device is connected to your phone. 4. Can I cancel while backup or restore is in progress? Yes, tap on the ‘X’ button to cancel the backup process. 1. How do I encrypt (password protect) files or a folder within In-App Storage or External Storage? Navigate to the file you would like to lock and tap ‘Select’ at the top right corner. Select the file(s) or folder. Enter any alphanumeric characters twice to confirm. Note: Only files and folders stored in “In-App Storage” or “External Storage” can be locked. 2. How do I decrypt encrypted files and folders? You will be prompted to enter the password to unlock it. 3. How do I use the App Lock to lock the Lexar Mobile Manager App? Tap ‘App Lock’ and enter a four digit numeric passcode. Follow the prompt and re-enter the password to confirm. The app is now locked. Once enabled, you will be prompted to enter the 4‑digit passcode every time the app is launched. To disable the app lock, turn App Lock off in Settings. Enter the four digit numeric password used to initially lock the app. CF 6 is a CompactFlash® memory card specification. 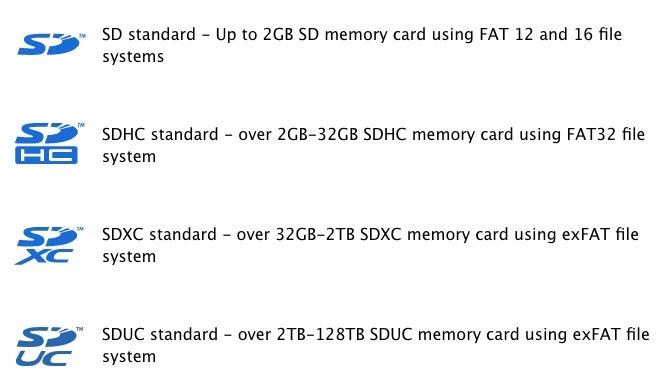 This new CF memory card specification allows capacities up to 144PB and measurable speeds up to 167MB/sec. This can be compared to the previous CF 4.1 specification, which only allowed capacities up to 137GB and measurable speeds up to 133MB/sec. UDMA 7, which stands for Ultra Direct Mode Access 7, is the latest transfer mode under the UDMA interface. UDMA 7 allows a maximum transfer rate of up to 167MB/sec. This can be compared to the previous UDMA mode, UDMA 6, which allowed transfer rates of up to 133MB/sec. The VPG-20 logo represent adherence to the Video Performance Guarantee-20 specification for professional-quality video. When used with a compatible camera, the VPG-20 logo on a card means that the system has been tested and guaranteed for professional video capture streams at up to 20MB/sec. This enables professional-quality video capture at high frame rates with no dropped frames. Can I use a CF 6/UDMA 7 CompactFlash memory card with older host devices? Yes! All Lexar® CF memory cards built with CF 6/UDMA 7 technology can be used with existing CF and CF UDMA devices (backwards compatible). Pairing your CF 6/UDMA 7 enabled CF memory card with a CF 6/UDMA 7 enabled host device is recommended to fully take advantage of the performance benefits from your CF 6/UDMA 7 enabled memory card. Which host devices in the market today are UDMA 7 compatible? The Canon EOS 1D-X is UDMA 7 enabled. The Canon EOS 7D, EOS 50D, EOS 1D Mark IV and the EOS 5D Mark II can be UDMA 7 enabled though a firmware upgrade. Which Lexar card readers are compatible with my Lexar Professional 1000x CF memory card? The Lexar Professional USB Dual-Slot Card Readers are compatible with the Lexar Professional 1000x CF cards. To optimize the card’s performance, pair the Lexar Professional 1000x CF card with a Lexar Professional USB 3.0 Dual-Slot Reader, which now supports UDMA 7. A firmware download is essential for 1000x CF card functionality on the older Lexar Professional USB 3.0 dual-slot card reader, and can be downloaded here. Do Lexar CF cards support the exFAT file system? Lexar CF cards are shipped formatted with the FAT32 file system. Lexar recommends re-formatting the card in the camera before first use. What is the benefit of using a Lexar CF 6/UDMA 7 CompactFlash card? Lexar Professional memory cards accelerate the digital photography workflow. Lexar Professional CompactFlash cards deliver professional level, high-speed performance and reliability, with minimum guaranteed speeds. Capture and store high-quality images and 1080p HD video, and transfer files faster to maximize workflow. Lexar Professional CompactFlash cards include Image Rescue® 4 software and come with a limited lifetime warranty. With Lexar Professional CF cards you can count on high-speed performance to save time, beat your deadline, and gain competitive advantage. What is the CFast™ format? CFast is the latest evolution of card format from the CompactFlash Association and provides a higher maximum transfer rate than CompactFlash® cards. CFast cards are similar in size to CompactFlash cards, but do not have any pins which can bend in the connector. The format was primarily designed to support the capabilities of next-generation of camcorders and DSLR cameras. Are CFast cards compatible with CompactFlash cameras? No. Despite physical similarities, CFast cards are not compatible with CompactFlash devices. How fast is the Lexar® Professional 3400x CFast 2.0 card? The Lexar Professional 3400x CFast 2.0 card delivers a read transfer speed up to 3400x (510MB/s), which is three times faster than today’s fastest CompactFlash cards. * The card leverages these new speed thresholds to allow you to capture, store, and transfer high-quality photos and 1080p full-HD, 3D, and 4K video. *Up to 510MB/s read transfer, write speeds lower. Speeds based on internal testing. Actual performance may vary. x=150KB/s. 3x faster claim based on reported CompactFlash speed specification. Why are cards going to faster standards? The development of technologies like XQD™ and CFast™ address the increasing capabilities of today’s cameras, as well as the ever-growing demands placed on professional photographers and videographers. Is there a Lexar card reader that works with this card? Yes. The card is designed to leverage next-generation Thunderbolt 2 speeds when used with the Professional Workflow CR2 reader (as well as the Professional Workflow HR2 hub). The card also works with the Professional Workflow CR1 reader and Professional Workflow HR1 hub (both at USB 3.0 speeds). What devices work with this card? Canon, ARRI, and Phase One have announced support for the CFast card format, so you can expect to see cameras from them in the future. What cameras are compatible with Lexar CFast cards? What cameras are compatible with Lexar XQD cards? What does SAFE stand for? Why does Lexar offer multiple SAFE solutions? Lexar® JumpDrive SAFE S3000 FIPS is specifically engineered for government, military, and enterprise users who require ultra high security to meet agency directives Lexar JumpDrive SAFE S3000 is designed for users looking for enterprise-level security that is scaled to meet the budget and performance demands of small businesses. What makes Lexar JumpDrive SAFE unique? Lexar JumpDrive SAFE combines 3 key elements to provide a secure flash drive. What does FIPS stand for? Why does the Gemalto brand name appear on the application graphical user interface (GUI)? Lexar JumpDrive SAFE is jointly developed by Lexar and Gemalto, combining Lexar’s secure solid state storage technology and Gemalto’s .NET smart card technology. What is the difference between the Lexar JumpDrive SAFE S3000 and Lexar JumpDrive SAFE S3000 FIPS? Does the encryption reduce the drive performance? No, the hardware-based 256-bit AES engine performs on-the-fly encryption and does not impact performance. Do I need to install a driver and/or software for Lexar JumpDrive SAFE? No, the Lexar JumpDrive SAFE is fully plug and play and does not require any drivers or software to be installed on the host computer. Do I need administrator privileges (on Operating Systems) for Lexar JumpDrive SAFE to work? No, the Lexar JumpDrive SAFE does not require administrator privileges to work. How does encryption protect my data? All drive content is encrypted with the NIST standard AES encryption algorithm and stored in ciphered form on the flash memory. The encryption key used to perform the encryption is stored securely on the embedded tamper-proof smart card, protecting it from unauthorized access. Without the knowledge of the encryption key, it is exceedingly difficult to extract the data from the cipher, even if one is able to disassemble the drive to access the flash memory. Why is hardware-based encryption more secure? A software-based encryption runs on top, and utilizes the shared memory space of the computer operating system to store such contents as encryption keys. Other processes on the operating system may be able to access the same memory space, and in so doing, compromise security. A hardware-based encryption uses the memory space within the device itself, eliminating the risk of access by other processes external to the flash drive. How does the smart card protect my data? Tamper-proof storage: Smart cards provide a means of securely storing data on the card. This data can only be accessed through the smart card operating system with authorized access rights. This feature is utilized to store the encryption key, the login password, and the other security parameters. Isolation of security-critical computations: Operations involving authentication, key generation, and storage are isolated from other parts of the device and host computer that do not have a “need to know.” These operations are all performed on the smart card only. Why is smart card-based authentication more secure than other methods of authentication? The secure microcontrollers used in Gemalto smart cards have security features manufactured into the ICs that thwart attackers from accessing any sensitive information that is stored in the card. Gemalto smart card technology is extremely difficult to duplicate or forge and has built-in tamper protection. Smart card chips include a variety of hardware and software capabilities that detect and react to tampering attempts and help counter possible attacks. This reflects in Common Criteria level EAL 5+ certification achieved by the Gemalto smart card micro-controller. In addition, smart card technology provides secure hardware-based key generation and storage and standard PKI-based challenge-response process to unblock access. Gemalto smart card technology provides security benefits at a number of levels that other hardware-based authentication mechanisms cannot match. How does the Lexar JumpDrive SAFE S3000 behave if it comes under a password dictionary attack? The Lexar JumpDrive SAFE S3000 permits up to 5 login attempts. The Lexar JumpDrive SAFE S3000 also introduces an increasing delay after each incorrect attempt before the next login can be attempted. Once the attempts are exceeded, the device rejects further login attempts until the user provides the correct answer to the security question. Are copies of the password and cryptographic key saved on the host computer? No. Both the password and cryptographic key are stored securely only on the smart card. The Lexar JumpDrive SAFE S3000 allows password reset once the correct answer is provided to the security question. A new password must be set but no data is erased. If however a user forgets the answer to the security question and exceeds 5 login attempts, the Lexar JumpDrive SAFE S3000 becomes permanently disabled and cannot be recovered. Does the Lexar JumpDrive SAFE S3000 perform any operations that leave traces on the host computer? No. All operations are contained within the drive, leaving no trace on the host machine. How are the encryption keys generated? The encryption keys are generated by the smart card’s Random Number Generator (RNG) and are stored securely in the smart card’s non-volatile memory. The keys are not stored in the flash memory or the host computer, or transmitted across the USB port. How is the Lexar JumpDrive SAFE S3000 password protected? The login password is hashed before being transmitted to Lexar JumpDrive SAFE S3000, and then stored in the tamper-proof smart card. The password validation uses challenge-response process combining with zero-knowledge transfer mechanism. The authentication is performed on the smart card only; there is no way to retrieve the stored password from the smart card. Access is granted only when password has been validated by the smart card. If login attempts are exceeded, the device rejects further login attempts. Does the Lexar JumpDrive SAFE S3000 support complex passwords? The JumpDrive SAFE S3000 supports complex passwords, but does not enforce it. The main reason for a complex password is to deter software-based password dictionary attacks. The SAFE S3000 defeats such attacks with the smart card. The smart card permits only a limited number of login attempts and introduces an increasing delay after each incorrect attempt before the next login can be attempted. How do I get the login application to start automatically? The JumpDrive SAFE S3000 – FIPS is already connected when you start the PC or reboot the PC. You are logged on to Windows as a guest. If none of the above is the case, the AutoPlay feature is likely deactivated. If AutoPlay is already activated, you will need to start the application manually by double-clicking the file ”JumpDriveS3000_PC.exe” in the JumpDrive drive. Why does a “reboot PC” message appear the first time I insert the JumpDrive SAFE to my PC? There is no need to restart the PC. Click Cancel to close the message. I do not see drive letter assigned to the JumpDrive SAFE. What should I do? The JumpDrive SAFE S3000 is attempting to use a drive letter that is already assigned to other drives (such as a network mapped drive.) This may be common in a corporate environment. If you are using Windows Vista, please update to Service Pack 1 (SP1). This issue should not occur with Windows SP1. 4. Look for the JumpDrive SAFE drive that has a drive letter in conflict. The “Safely Remove Device” feature is not working. What should I do? The “Safely Remove Device” feature may not work if the JumpDrive SAFE is being used by other applications. Check that all applications using the JumpDrive SAFE are closed (such as Windows Explorer)Lock the JumpDrive SAFE, and then try safely removing the JumpDrive again. The “safely remove device” feature is not supported on Windows 2000. Before removing the JumpDrive SAFE, ensure there is no active operation (the blue LED is not blinking). Close all applications that were using the JumpDrive SAFE. Lock the JumpDrive SAFE. Once it is locked, it is safe to remove the JumpDrive. Download Vista SP1 from the Microsoft Web site. Request the hotfix provided by Microsoft. For more information, refer to article 937454 in the Microsoft Knowledge base. “Windows Vista is telling me to scan and fix a drive. What should I do? After unlocking the JumpDrive SAFE, Windows Vista displays a message asking the user to scan and fix the drive. This is a Windows Vista issue that happens if the JumpDrive was not safely removed previously when connected to a computer running Windows XP. There is no need to scan and fix the drive. Simply continue without scanning. MAC – I am unable to connect more than one JumpDrive SAFE to the same computer simultaneously. What can I do? If more than one JumpDrive SAFE is connected to the same Mac computer, you are unable to assess both simultaneously. This feature is not currently supported on Mac computers. It is however supported on Windows-based computers. The application screen remains open even after I remove the JumpDrive SAFE. This issue occurs only in the Mac Leopard OS. When you remove the JumpDrive SAFE, the application does not exit and the window remains open. If you attempt to use the application, it will exit with an error. After removing the JumpDrive SAFE, manually close the application window. MAC – The Application Support directory remains open even after removing the JumpDrive SAFE. This issue occurs only in the Mac Leopard OS. When you insert the JumpDrive SAFE, Finder automatically opens the Application Support directory and this window remains open, even after removing the device. When you remove the JumpDrive SAFE, manually close the Application Support directory. I formatted the JumpDrive SAFE using the Mac Disk utility and now the drive does not operate correctly. This issue occurs only in the Mac Tiger OS. If you reformat your JumpDrive SAFE with the Mac Disk Utility, choose MS-DOS as the operating system. If the JumpDrive SAFE was formatted to a Mac OS, it will no longer operate correctly on a Windows-based computer. What are Lexar Echo backup drives? Lexar Echo backup drives are portable backup solutions designed for netbook and notebook users, providing continuous backup of working files while on the go. What is the difference between the Lexar Echo backup drives? What makes Lexar Echo drives unique? How do I secure the files I back up? Lexar Echo backup drives provide password protection and also give you the option to secure files with 128-bit AES encryption. When creating a backup plan, select “encrypted profile” and register a login password. All data backed up under that plan is encrypted and accessible only through providing the correct password. Do I need to install a driver and/or software? You have the option to install the Lexar Echo Backup Manager to enable backup to start automatically when the Echo drive is plugged in. Do I need administrator privileges (on operating systems) for Echo backup drives to work? No, the Lexar Echo backup drives do not require administrator privileges to work. How do I open a backed up file? For a non-encrypted backup plan, you can access your data manually by going to the “My Backup folder” from the root of the Echo drive. Or you can locate the file under the “View Files” tab on the main status screen and double-click the file. For an encrypted backup plan, you need to first restore the file to your computer before it can be opened. How do I save multiple versions of a file? By default, Echo backup drives store 3 versions of a file. You can adjust the number of versions to be saved by clicking on the Advanced Settings button under Options. The maximum number is 10. How do I open a previous version of a file? You need to first restore the file to your computer before it can be opened. Can I have multiple backup plans on one Echo drive? Yes, you can create and manage multiple backup plans with one Echo drive. The first plan created on a computer is set as the default plan. When the Echo drive is connected to the same computer, the software automatically loads the default plan. Additional plans can be created and the default plan can be changed. Can I use my Echo drive on multiple computers? Yes, each backup plan is associated with a computer. You can create one or multiple plans for one or multiple computers. When the Echo drive is connected, the software automatically loads the default plan for that computer. Can I back up a file on a PC and restore it on a Mac® computer, and vice versa? Yes, Echo backup drives work across different operating systems and provide easy access to your data whether you are using a PC or a Mac system through one seamless interface. This is true even when the data is encrypted on a PC and needs to be restored on a Mac system or vice versa. I have files larger than 4GB in size. How do I back up these files to my Echo drive? In order to backup files larger than 4GB in size, the Echo drive has to be reformatted to NTFS file system. Before you begin, first ensure that you copy the Echo backup software to your computer as formatting will erase all files on the Echo drive. After formatting is complete, copy the software back to your Echo drive. I received the error “Could not contact server” when I tried to activate the Echo backup software. What should I do? There may be one of two reasons: A) the activation server is under maintenance and cannot activate the software in which case we suggest that you try again later. and B) the computer is not connected to the Internet. Please verify that your Internet connection is active. How do I uninstall the Echo Backup Manager? Go to Start Menu > All Programs> Lexar Echo Backup Manager, and click on the Uninstall button. Follow the onscreen instructions to completely remove the Backup Manager from your computer. How do I update the Echo Backup software? From the main status screen, click Help. The pull-down menu appears. Click Update. Note: When a new release is available for download, an Update dialog box will appear, providing updates instructions (assuming that the computer is connected to the Internet). Will I lose my backed up data when I update the software? No. The update is applied to the software files only and does not impact the backed-up data or the backup plans. Does the software update apply to both Windows and Mac version at the same time? The Windows version update is separate and independent from that of the Mac version. The update is applied individually. How can I use my JumpDrive Secure on computers with different Operating Systems? When using your JumpDrive Secure, you should not encounter any problems between computers that have Windows 2000 or Windows XP.If one of the computers you use your JumpDrive on is Windows 98, 98SE or ME, you will not be able to use the Secure Partition of your drive since the Secure software is not compatible with this version of Windows. You will however, be able to access all files on the Public Partition of your drive. If you are using Windows 98, 98SE or ME and you have installed the necessary driver, it is possible that you may receive a MFC42U.dll Error. If you do, we recommend that you copy the Secure Software that comes with the drive and save it on your hard drive. Once you have successfully copied over the files, you can delete it from your JumpDrive. This will prevent any errors from popping up when you connect your JumpDrive. Once again, the Secure software is not compatible with Windows 98, 98SE or ME, but you can still use the JumpDrive as a Mass Storage Device. Every time I connect my JumpDrive Secure on my computer using Windows 98, 98SE or ME, I receive an error. How can I get rid of this? 1. Delete the Secure software from the JumpDrive. 2. Format your JumpDrive. Please be advised that this will delete all files on your JumpDrive. 3. Delete the autorun.inf file. This will prevent the drive from trying to auto-launch the Secure Software. Please refer to the instructions below to update your JumpDrive Secure to version 3.2. This will correct the error you are encountering. Though there are many steps to complete this, this process will only take a few minutes. – Create a folder on your Desktop and copy all files from your JumpDrive to this folder. – Copy the entire JumpDrive Secure folder onto your Desktop. – Verify that there are no important files on your JumpDrive. The next step requires you to Format your JumpDrive. Once you do this, you will be deleting all files from your JumpDrive. – Go to My Computer and locate your JumpDrive. Right-Click on the icon and Select Format from the Menu. – Once the drive is formatted, go to the following link to download version 3.2 for JumpDrive Secure. http://lexar.com/drivers. Once you have downloaded the zip file, you will see a Word Document, which will give you step-by-step instructions on how to install the software update on your JumpDrive Secure. Please read this document prior to installing the software on your JumpDrive. Once you have completed the above steps, you will be able to re-configure your drive utilizing the 3.2 Version of the JumpDrive Secure Software. – Make sure that all files that you opened from your JumpDrive are closed. This will allow you to safely remove your JumpDrive. Lexar always recommends you to follow the above steps for any JumpDrive you may own. When I use my JumpDrive Secure, I received an Error: 10303. Invalid secure partition found in JumpDrive. This error will only happen the first time you use your JumpDrive after upgrading from Version 2.0 to Version 3.1. My JumpDrive Secure works on the USB ports on the back of the computer but not on the front. Why? The problem that you are encountering is possibly due to a driver error or conflict. Please complete the following steps to allow the port you would like to use active. – Click on Each Controller to see what Driver it is using. – Once the Driver is updated, insert your JumpDrive into the port. Once you complete the steps above, it should resolve your issue. The problem you are encountering is usually because the JumpDrive is removed from the computer without safely exiting the drive. When the Jump drive software loads up, it closes Windows Explorer window. How do I stop this from happening? Unfortunately, there is no way to prevent this. When you insert the JumpDrive Secure, it needs to be able to read some very low-level information and is not able to do it with Explorer open. I received Error 10503. Application could not be initialized. Please restart. I created public and private zone using the slider and it doesn’t add up. – Windows Calculation is different. I received Error 10004 Application could not find any Jump Drive connected to the system. – Check to see if Network Drive is mapped but not connected. If so, remove. If this does not resolve the issue, please contact our support team. This error typically appears if the JumpDrive Secure is in use or if files from your JumpDrive are open when you are trying exit the JumpDrive Secure Application. – Make sure all open files from the Secure Drive are closed. This should resolve the error message. This error typically appears if the JumpDrive Secure is unable to load the required driver. If you receive this error, please reboot your system. This will typically resolve the error message. After plugging in my USB flash drive, why doesn’t my computer recognize it? Please re-attach the flash drive and run the application again. Why does the flash drive show less than the total capacity? The total capacity is divided up between the public partition and secure partition. Users can change the capacity of the secure partition once their fingerprints have been authenticated. Can the secure partition of the flash drive be accessed through my smartphone? Only the public partition can be accessed through your smartphone. Why can’t files larger than 4GB be saved to the flash drive? The initial format of the F35 is FAT32; you need to re-format it to exFAT when transmitting files larger than 4GB. Please note all files on the drive will be lost if you re-format. However, the fingerprint application itself, will not be erased. What systems are compatible with the fingerprint application? The fingerprint application can be operated in Windows XP, Windows Vista, Windows 7, Windows 8, Windows 10. What are the minimum requirements to set up an admin/user account or change the partition size of the drive? The fingerprint application requires Windows XP and up.The fingerprint application is required to setup any accounts or changes to the partition size. If I have an older version of Windows, Mac OS, or Linux, can I still access the public and secure partitions? Regular flash drive use is compatible with Windows, Linux, and macOS. Why does the secure partition disappear after 15 minutes? The secure partition is designed to close after 15 minutes of inactivity for security purposes. To re-access the secure partition, simply place an authorized fingerprint on the sensor and it will re-open. What type of encryption is used on the Lexar F35 fingerprint flash drive? Encryption is based on the 256-bit AES method. The fingerprint data is saved on the flash drive with an exclusive UID produced by FP IC. Since the fingerprint data and fingerprint algorithm is separate, the data saved in the secure partition will be lost if the flash drive is dismantled by force. How many chances do I have to enter my administrator password correctly? If the user enters an incorrect password more than 254 times in succession, the F35 will start the process of self-destruction. All data in the USB flash drive will be erased, and the F35 can only be recovered by downloading the firmware again. Why can’t I access the secure partition after placing my finger on the fingerprint sensor several times? Ensure your fingerprint and sensor are clean and dry. If that doesn’t work, try re-attaching the flash drive. Which Lexar products work with the Lexar Media Manager app? Currently, the Lexar Media Manager app works with the Lexar JumpDrive® C25i flash drive. For a listing of products that the Lexar Media Manager works with, check out the compatibility list on www.lexar.com/support. To determine if this app is right for your Lexar iOS-compatible product, visit your product’s information page on lexar.com. How do I get the Lexar Media Manager app? You can download the app from the App store®. What is the difference between the Lexar Media Manager app and the Lexar Mobile Manager app? I see both on the App Store. Is the Lexar Media Manager available for Android? No, the Lexar Media Manager is an app that works with Apple® iOS products. Which Apple devices are compatible with the Lexar Media Manager app? The app is compatible with iPhone 5/5s/5c, iPhone 6/6s/6s Plus, iPhone 7/7 Plus, iPhone SE, iPad mini 2/3/4, iPad 4, iPad Air 1/2, iPad Pro 9.7 inch/12.9 inch, and iPod touch (sixth generation). Which music and video file formats are compatible with the Lexar Media Manager? Note: Does not support streaming of DRM-protected content. Contact your content provider for details and restrictions. Will the Lexar Media Manager app work with other manufacturer’s flash drives? No, the Media Manager app will only work with Lexar products. Does the app work the same on a tablet as on an iPhone? The functionality of the app is the same. There may be slight differences in navigation due to the available screen size of the tablet vs. the iPhone format. On the Home screen, what does the percentage and the “free” refer to under Internal Storage and External Storage? The home screen displays your available storage on your device (phone/tablet) under Internal Storage, and your available storage on your connected Lexar product under External Storage. Why can’t I see all the files on my phone/tablet when I tap on “Internal Storage” on the Home screen. Tapping on Internal Storage on the Home screen provides access to only those files stored in the app’s internal storage, and does not provide access to all files on your device. What does External Storage refer to? External storage is the storage on your connected Lexar iOS-compatible device. Why does External Storage say N/A? External Storage will display N/A until you connect your Lexar iOS-compatible device. I have added files to my external storage device and the storage available display has not changed. How do I get it to refresh? Tap on the refresh icon in the upper right corner of the Home screen to immediately refresh your available storage display. What do the individual icons on the Home screen do? Tapping on “Music,” “Photos,” “Videos,” or “Documents” will display only those file types, whether stored in Internal Storage (within the app), or in External Storage (on your Lexar device). Backup will take you to the backup function, and camera will launch the app’s camera. How do I modify the app’s settings? To access the Settings screen, tap on the settings icon located in the upper right corner of the Home screen. What does toggling the Support setting to the On position do?Turning on the Support function creates a new email to the Lexar support team from the primary email address linked to your device. It will automatically include your app specifications, making it easy for you to send an email to get answers based on your version of the app. What is required for TouchID to work with my app? This function will only work with devices with TouchID. TouchID must be available and enabled on your device. Do I need to toggle the Auto Backup function to the On position in order to do any backups? The Auto Backup function in the Settings screen will allow automatic backups of photos, contacts, or both, every time your Lexar iOS-compatible product is connected to your device. You can still perform manual backups at any time, regardless of whether the Auto Backup function is turned on or not. Which files will Auto Backup back up to my Lexar iOS-compatible product? This function will back up photos and videos that are stored in your camera roll, and contacts stored on your device. It will not back up any files saved in the app’s Internal Storage. Do the camera setting controls on the Settings screen control my device’s camera? The functions within Camera Settings on the app’s Settings screen control the settings for videos taken with the app camera only. When running Auto Backup, will I be given the option to automatically delete the files after update? No, the automatic backup function does not automatically delete files after backup. To do this, select manual backup of photos. When doing a manual backup of photos on my iPhone and selecting “Yes” to the message asking whether I want to delete the photos after backup, why does the space available on my Internal Storage display not show a difference? For safety and in case of accidental deletion, your iOS device keeps a folder in your Photo Album of “Recently Deleted” photos. Your deleted photos will be in this folder for 30 days, at which time they will expire. You can delete them immediately by navigating to the folder and selecting all (or some) of the photos and delete them immediately. Once the photos are removed completely from your device, you will notice the storage space percentage and free under Internal Storage on the Home screen will reflect the updated storage availability. Why can’t I move all of my music files to my external storage? Only music files not protected by Digital Rights Management (DRM) can be managed with the Lexar Media Manager app. Files that are protected may show up on your music file list in the app, but they will appear greyed out, and you will not be able to select those files. I’ve lost my password for File Lock (Encrypt) and/or App Lock. How do I retrieve it? Your password is unique to you and Lexar does not keep a copy of it, so there is no way to retrieve a copy of it when it is lost. It’s a good idea to choose a password you know you’ll remember, or jot it down somewhere so you can access it if you forget it. I still have questions about the app. Where can I go for help? When Image Rescue 5 launches the scan window will be displayed. Choose the card to scan using the pull-down menu. Click Start to begin the scan. After the scan is completed, some additional processing will occur, and then thumbnails of any found photos are added to the Image Recovery Window. The Image Recovery Window displays either a thumbnail image or a generic icon if the photo is damaged or is a movie. To recover a file, you can double-click it to open in its default viewer, or select one or more files and click Recover. If you click Recover, select the folder where you want the recovered files to go. Disclaimer: Lexar Media assumes no liability for damage to the customer’s equipment or data caused by the use or misuse of the format functions. These processes are designed to remove all data from a storage device. Format will initialize a card with the choice of FAT or exFAT filesystem for use with a camera. Secure Format can be used to permanently delete all information from a card. Before the process begins, you have the option of selecting a filesystem to use (FAT or exFAT). exFAT should only be used if you know your camera supports it. Insert the Lexar Flash drive into your PC or Mac; The Lexar – EncryptStick Registration page appears. Encrypt Stick will automatically startup. If it doesn’t, browse to the flash drive and double click encryptstick.exe (for PC) or encryptstick.app (for Mac) to get started. Enter your email address for update notifications (optional). Click OK; The password creation screen will appear. Enter a password in the ‘Create your password’ field. The password entered will be used to protect your private files. The strength of your password will be determined by the criteria you select. Enter the same password again in the ‘Confirm your password’ field. If you are unable to click OK, it means that your password does not comply with those criteria settings shown in red. You can either change your password to match the strength criteria (recommended) or uncheck the option (not recommended). Double Click on the vault icon in the upper pane to open the vault and add folders and files. Creating a New Folder Click on the new Folder(+) icon on the Menu bar and name the new folder. Click on the X button to exit the program completely; this will automatically lock your vault. To ensure the integrity of the data on the flash drive, it is recommended that you use the usual Windows or Mac commands to eject or unmount the drive before removing it from the USB port. Insert your Lexar drive; Enter your password on the login screen to unlock your vault and run the program. If you are concerned about intruders, for even greater security, enter your password using the Virtual Keyboard. What is the Lexar® Professional Workflow line? Transfer files from multiple cards at once with the fully customizable Lexar Professional Workflow line of products. The line includes your choice of two four-bay hubs (Thunderbolt™ 2/USB 3.0 or USB 3.0), a selection of card readers (SDHC™/SDXC™ UHS-II, CompactFlash® UDMA 7, XQD™ 2.0, CFast™ 2.0, and microSDHC™/microSDXC™ UHS-II), and a two-port USB 3.0 hub. Its innovative, modular design lets you create a custom setup, while its high-speed performance lets you offload your work, faster. What products are available within the line? What’s included in each product box? What is the speed advantage of using the hub with readers? Lexar Professional Workflow provides high-speed file transfer at USB 3.0 speeds when using a USB 3.0 port. The throughput is totally dependent on your system specifications, including hard drive write speed, processor speed, memory, and operating system (not to mention the read speed of the cards you’re transferring from). All these variables make it hard to quote an actual performance rating. However, you can expect to see the best performance possible when using a well-equipped computer and a card with fast transfer speeds. Using the Thunderbolt 2 hub, you can expect to see even faster performance. Theoretical limits establish USB 3.0 at 5gbps and Thunderbolt 2 at 20gbps. 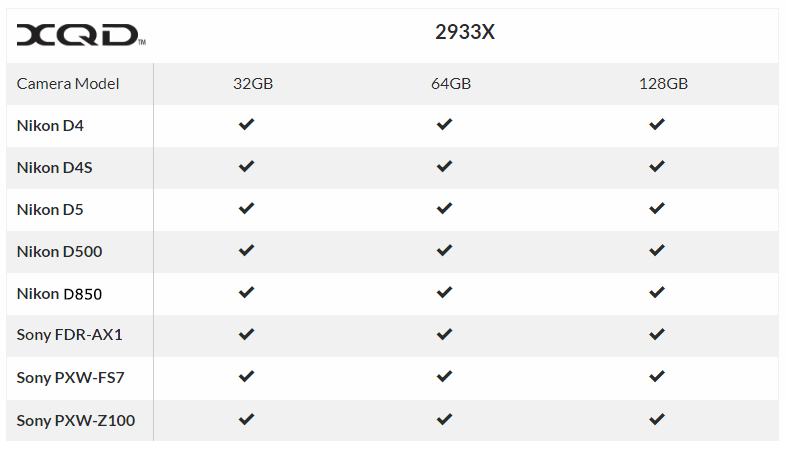 Therefore, you can generally expect to see up to 4x the performance depending on all the inputs listed above. Performance can greatly vary depending on card speed and the specs of your computer system. Why is it better to include a hub in my setup, rather than using a standalone single-slot reader? The main advantage is that you’ll save time with the ability to transfer data from multiple cards at once (concurrent transfer). With a single-slot reader, you can only transfer content one card at a time (consecutive transfer). With the hub fully populated with your choice of reader or hub modules, you can offload your work, faster. This lets you get to editing, sharing, and eventually back to shooting much sooner. Can I mix and match the reader combination I want? Yes, that’s one of the biggest advantages of using the Lexar Professional Workflow line—the ability to design a custom setup that fits your specific needs. For example, a Nikon D4 shooter may want two CompactFlash (CF) readers and two XQD 2.0 readers, whereas a Canon 5D Mark III shooter may want three CF readers and one SD UHS-II reader. Others may want one or more of the two-port USB 3.0 hubs as part of their workflow setup. Who is this line designed for? This product line was created with professional photographers, videographers, and enthusiasts in mind. It’s an excellent choice for those shooting with multiple cards, or using multiple cameras/video cameras. With the ability of today’s cameras to capture RAW images, high-res photos, 4K video, and beyond, there is a need for faster, higher capacity cards, and quicker transfer of large amounts of data from multiple cards. Now these functions can be done concurrently. And the two-port USB 3.0 module allows you to connect USB flash drives or additional readers, and even charge those devices. Where can I buy Professional Workflow line products? You can find them at select high-end photography retailers or etailers that sell photography products. You can also visitwww.lexar.com/workflow and click “Where to Buy” to find retailers that carry specific products within the line. Can I use the power adapter that came with my Professional Workflow HR1 with HR2? No, the Professional Workflow HR2 hub requires more power and therefore comes with a larger power supply. Please do not mix the power supplies between the units. Can I use the readers without the hub? Yes, each reader package includes a USB cable so you can use them on their own. This makes them an excellent on-the-go solution. Can I use the reader and two-port USB 3.0 hub modules without the HR1 and HR2 hubs? Yes, each module package includes a USB cable so you can use them on their own. This makes them excellent on-the-go solutions. How does the daisy-chain feature work using the Professional Workflow HR2 hub? To conveniently daisy-chain the hub anywhere in your lineup, you can use both Thunderbolt 2 ports on the back of the hub. Simply connect one Thunderbolt 2 cable from the hub to your computer or other device and then connect the hub to the Thunderbolt 2 cable from the next device, such as a monitor or hard drive. Thunderbolt 2 technology allows for up to six devices to be daisy-chained to one port on your computer. To ensure the best performance, consider placing your hub at the beginning of the chain, closest to your computer. Why do the LEDs on my readers blink? This indicates that the reader is in the process of transferring data from your card to your computer. When your reader’s LED is blinking, do not remove the card or remove the reader from the hub. Are there any recommended reader-specific configurations when using the hubs? Photographers and videographers who are shooting solely with CompactFlash (CF)-based cameras will likely want to purchase four CF readers. Nikon D5 shooters will likely want two CF and two XQD 2.0 readers (assuming they are using both slots in their camera). Canon DSLR users will likely want a combination of CF and SD UHS-II readers (since some Canon cameras tend to use either of both form factors). Many photographers use CF-based cameras for their primary camera and a point-and-shoot camera for general use or scouting. These shooters may also want a combination of CF and SD readers in their hub. What is the reader hood? Each Professional Workflow reader comes with a hood, which is a silicone cover that helps protect the reader slot(s) from debris. This is useful if you travel with your readers or frequently slip them in and out of a camera bag. It also helps to protect your reader investment. Why is a USB type B connector used? This connector is durable and provides for solid, smooth insertion and removal of the readers in and out of the hub. Does the Professional Workflow HR1 or HR2 hub need to be plugged into AC power to work? Yes, in order for either hub to work correctly, it must be plugged in. There is not enough power supplied from the USB port on a computer to power this device. Why am I getting a series of ‘Drive removed incorrectly’ messages after my Mac wakes from hibernation? Occasionally, the hub may not be recognized after waking. If this happens, please unplug your HR1 or HR2 hub from your Mac and plug it back in. If this doesn’t resolve the issue, you may need to restart your computer. You don’t provide a power adapter that complies with my country’s regulatory guidelines. How can I use the Professional Workflow HR1 or HR2 hub? We’ve worked diligently to provide as many region-specific adapters as possible, but we’re unable to meet the need in every country. If you are in one of these regions, you can purchase a travel converter that meets your country’s international power adapter needs to use with the power supply provided with your Professional Workflow Reader HR1 or HR2 hub. Please ensure that the adapter you purchase meets the requirements of your country’s power adapter guidelines. Why do I get an error message on my computer saying that I do not have enough power to transfer files when using one of the Lexar Professional Workflow hubs? This error occurs when the power cord is not connected to the Professional Workflow HR1 or HR2 hub, or the power supply is not connected to a wall outlet or a power source. Properly connect the hub to resolve the error. What card formats do the Professional Workflow readers support? Currently, the product line includes readers that support SD UHS-I and UHS-II, CompactFlash UDMA 7, CFast or CFast 2.0 (Thunderbolt or USB 3.0), XQD 2.0, and microSD UHS-I and UHS-II formats. And for versatility, the CFast 2.0 reader is backwards compatible with the 1.0 format (at 1.0 speeds). As technology evolves and we launch new card formats, we’ll also create new readers for this product line. This ability to purchase new reader formats helps to future-proof your workflow setup and save you money. Will my first-generation XQD card work in the Professional Workflow XR2 (XQD 2.0) reader? No. The XQD 2.0 reader is not backwards-compatible with XQD 1.0 format cards. XQD 2.0 memory cards can be identified by a boxed USB logo on the card label. Can I use the Professional Workflow SR2 (SD UHS-II) reader with my SD UHS-I memory cards? Yes, the reader is fully backwards-compatible with SD UHS-I cards (at UHS-I speeds), so you can use both SD UHS-I and UHS-II cards with the reader. Can I transfer data from three microSD cards at the same time using my Professional Workflow UR2 reader? Yes, if you plug a reader directly into a computer with the included USB 3.0 cable you can transfer data from each card concurrently. This is also possible using the Professional Workflow HR2 (high-speed Thunderbolt 2) or HR1 (USB 3.0) hub. NOTE: First-generation Professional Workflow HR1 hubs (Rev A) only support up to two Professional Workflow UR2 readers at once. To find the Professional Workflow HR1 model you’re using (Rev A or Rev B), check the label on the bottom of the product. How many Professional Workflow UR2 (three-slot microSDHC/microSDXC UHS-I) readers can I use with the HR1 and HR2 (four-bay) hubs? All Professional Workflow HR2 hubs leverage a high-speed Thunderbolt 2 interface, and accommodate up to four Professional Workflow UR2 three-slot readers, filling the hub and providing fast file transfer from 12 cards at once. The latest generation of HR1 USB 3.0 hubs (Rev B) are also capable of transferring files concurrently from up to four UR2 readers. What computer operating systems are compatible with the Lexar Professional Workflow line of products? Do I need a driver for my Thunderbolt 2/USB 3.0 reader or Thunderbolt 2 hub? Yes, Windows users should visit lexar.com/downloads to download the Thunderbolt 2 driver needed to ensure Windows PC compatibility. Will the aftermarket USB 3.0 port card that I installed in my Mac Pro® work with Professional Workflow line products? Yes, on most third-party USB 3.0 cards, it does. However, since this is an aftermarket product, the performance could potentially be slower than true USB 3.0 speeds. Does the Professional Workflow line work with Adobe® Photoshop® Lightroom® software? Yes. However, the software only supports consecutive downloads, not concurrent downloads. So downloads may take longer to complete. Does the Professional Workflow line work with Photo Mechanic™ software (Mac® and Windows)? Is my Lexar Portable SSD compatible with the Professional Workflow HR1 or HR2 hub? Yes. The Portable SSD will fit in either hub and complements the existing offerings in the Workflow line. Does the Multi-Card 25-in-1 USB 3.0 Reader support SDXC cards? Yes, but before inserting the SDXC card into the reader, please make sure the operating system of your computer is compatible with SDXC cards and supports the exFAT file format. The chart below will help determine if the operating system of your computer supports the exFAT file format. Note: Lexar recommends the use of the SD Formatter tool to correctly format SDXC cards (as opposed to the native OS formatting tools). Click here to install the SD 3.0 formatter. Do I have to install a driver before using the Lexar® Multi-Card 25-in-1 USB 3.0 Reader? No, the reader has a convenient plug-and-play design and does not require a driver. If you have difficulty using the reader, please contact technical support at support@lexar.com. What should I do if my computer can’t detect the Multi-Card 25-in-1 USB 3.0 Reader? Verify that the USB cable is properly connected into the USB port, and insert a card into the reader to see if the light flashes. If the LED does not flash, your computer may not be detecting the reader. Please contact technical support at support@lexar.com. I’m connected to a network drive and use Windows® XP operating system. Why can’t my system detect all five reader card slots when I click on MY COMPUTER? On the right side, you will see a drop-down menu with a letter. Does the Multi-Card 25-in-1 USB 3.0 Reader work with Windows 7 operating system? Yes, the reader is compatible with laptops running Windows XP, Windows Vista®, and Windows 7 operating systems. Does the Multi-Card 25-in-1 USB 3.0 Reader work with Mac OS® X operating system? Yes, the reader is compatible with Mac® systems running Mac OS 10.4 operating system and later. Is the Multi-Card 25-in-1 USB 3.0 Reader compatible with USB 2.0? Yes, the reader is backwards compatible with computers that have a USB 2.0 port. What card formats does the Multi-Card 25-in-1 USB 3.0 Reader support? The reader supports 25 popular memory card formats: CompactFlash® Type I and Type II, SD™, SDHC™, SDXC™, miniSD™, miniSDHC™, MMC™, MMCplus™, RS-MMC™, microSD™, microSDHC™, Memory Stick™, Memory Stick (with MagicGate™), Memory Stick PRO™, Memory Stick PRO Duo™, Memory Stick Duo (with MagicGate), Memory Stick PRO Duo Mark 2, Memory Stick PRO-HG Duo™, Memory Stick PRO-HG Duo “HX”, Memory Stick Micro™ (M2™), xD-Picture Card™, xD-Picture Card Type-M, xD-Picture Card Type-M+, and xD-Picture Card Type-H. I noticed the Lexar Professional USB 3.0 Dual-Slot Reader now supports UDMA 7. What does this mean? Addressing the latest developments in technology, Lexar has updated its existing Lexar Professional USB 3.0 Dual-Slot Reader to include UDMA 7 support. This allows you to leverage the speed enhancements of the latest high-performance Lexar Professional CompactFlash cards for even faster file transfer. For older Lexar Professional USB 3.0 Dual-Slot Card Readers, a firmware download is essential for CF 1000x card functionality. The firmware download is located here. My laptop/desktop computer has USB 2.0 port; will it work with the Lexar® Professional USB 3.0 Dual-Slot Reader? Yes, the reader is backwards compatible with USB 2.0 devices; however, the reader’s transfer speed will be reduced to 2.0 performance levels. You’ll need to connect the reader to a USB 3.0 device to maximize the performance capabilities of the reader. Do I need to install a driver before using the Lexar® Professional USB 3.0 Dual-Slot Reader? If you’re using a computer with USB 3.0 port, you will need to install a USB 3.0 driver onto the computer. The driver should be provided by the system or adapter manufacturer. If you’re plugging into a USB 2.0 port, there’s no driver needed. I don’t see any performance difference between the Lexar® Professional USB 3.0 Dual-Slot Reader and my existing USB 2.0 reader. What should I do? Performance may vary, depending on the read/write speed of the card and your system’s configuration. In order to experience the performance benefits of the Lexar Professional USB 3.0 Dual-Slot Reader, it must be plugged in to a USB 3.0 host device. What card formats does the reader support? The Lexar® Professional USB 3.0 Dual-Slot Reader supports the latest UDMA CompactFlash® (CF), SDXC™ (not supported on all operating system platforms), and SD UHS-I (SD 3.0) memory cards. It’s also backwards compatible with all standard CF, SD™, and SDHC™ cards. Does the Lexar® Professional USB 3.0 Dual-slot Reader support all SDXC™ cards? What should I do if my computer can’t detect the reader? Verify that the USB cable is properly connected to the USB port, and insert a card into the reader to see if the light flashes. If your computer still can’t detect the reader, please click on the “chat live” link at www.lexar.com/support or call the Lexar technical support hotline at (510) 413-1275 for further assistance. Does the reader work with a MAC® system? Yes, the reader works with Mac OS 10+. However, we are aware of the compatibility issues users may be experiencing when trying to use the Lexar Professional USB 3.0 Dual-Slot Reader with the newest MacBooks, and we’re working diligently to provide a firmware upgrade in the near future. Does the reader work with Windows® operating systems? Yes, the reader works with Windows 7, Vista™, and XP. What is the difference between FireWire 800 and FireWire 400? FireWire 400 is known in the industry as 1394a. FireWire 800 (known as 1394b) is the latest new standard, and offers twice the transfer-rate speed as traditional FireWire 400. What kind of performance can I expect from the new Lexar Professional UDMA FireWire 800 reader? Is it faster than the FireWire 400 readers? FireWire 800 doubles the throughput of the original FireWire 400 interface with transfer speeds up to 800 Mb/sec. Are the connections / ports the same for the FireWire 400 and FireWire 800? FireWire 400 devices use a 6-pin or 4-pin connector while FireWire 800 devices use a 9-pin connector. Existing FireWire 400 devices can be plugged into either type of port with the appropriate cable. FireWire 800 devices can achieve FireWire 800 speeds only when connected directly to a FireWire 800 port. Will my older Lexar 40x 512MB CompactFlash card work in my new Lexar Professional UDMA FireWire 800 Reader? Yes, the reader is backwards compatible to the older generation of Lexar CF cards. What is the difference between a UDMA CF card and a standard CF cards? UDMA is a new CompactFlash protocol that allows CF cards to transfer information faster than the previous protocol (PIO Mode 5 and 6). I use a Nikon D100 Pro series camera. Will it take advantage of the UDMA technology? No it will not. To determine if your camera can take advantage of the UDMA technology check with your camera manufacturer. What is the best way to achieve the blazing-fast transfer speeds capable with Lexar readers? In order to achieve the fastest possible throughput make sure to use the Lexar Professional UDMA FireWire 800 reader and a Lexar Professional UDMA 300x CompactFlash card. Do I need to install the driver before use? Mac® systems: To help ensure the reader functions properly with your MacBook® computer, we recommend that you install the driver before use. If you have not installed the driver and are experiencing technical problems with the reader, it may resolve them if you install the driver. Windows® based systems: We recommend installing the driver when using a 32GB or higher capacity CompactFlash® card. Scroll down the page and select the appropriate operating system for your computer and follow the instructions todownload the driver to your laptop computer. Once you have downloaded the driver, open the file and follow the driver installation instructions. What should I do if my computer doesn’t detect the reader? First, check that the reader is fully connected in the ExpressCard slot of your laptop. Please make sure to install the driver—visit www.lexar.com/download to download and install. If the reader still isn’t detected after installing the driver, please click on the “chat live” link at http://www.lexar.com/support/ or call the Lexar technical support hotline for further assistance. What should I do if my Mac system crashes when I insert the reader into the slot? Allow your system to reboot and make sure to insert the reader into the system with CompactFlash card already inside the reader. If you have not installed the driver, please visit www.lexar.com/download to download and install. My MacBook Pro computer crashes when I try to view photos from my CompactFlash card. What should I do? To view photos, please transfer and save all images from your CompactFlash card to the computer first before viewing images. Do NOT view images directly from the card if you are using a MacBook Pro computer with 4GB of DRAM and above. It will cause the system to stall. What ExpressCard slot size does the Professional ExpressCard CompactFlash Reader support? It supports both 54mm and 34mm ExpressCard slots. Does the reader work with the Windows 7 operating system? Yes, the reader supports the Windows 7 operating system. Does the reader work with Mac OS X operating system? Yes, the reader is compatible with MacBook Pro systems running Mac OS v10.4 and later. Please remember to install the driver. I don’t see an ExpressCard logo on the reader. Is this reader ExpressCard certified? The Professional ExpressCard Reader is currently in the process of being certified by the PCMCIA Association. The reader works with both 34mm and 54mm ExpressCard slots. 1394 Firewire is the name of a high-speed and high-performance serial bus, often called FireWire. What are the supported data-transfer rates for FireWire? The FireWire serial bus standard defines data rates of 100, 200 and 400MB per second across the cable. What type of Compact Flash cards can I use with the Lexar FireWire? How do I remove the card from the Lexar FireWire Reader? For Mac: The card must be ejected or unmounted by dragging the disk icon to the “TRASH” before pushing the eject button on the Lexar FireWire adapter. For PC: Just push the eject button to remove the digital film. What capacities of Lexar CompactFlash cards are supported? The supported capacities are 8MB to 4GB. Can I use any CompactFlash? Yes, Lexar tests with many different manufacturers of products to insure compatibility. Do I need a separate driver for Windows? No, the driver is already included in Windows 98SE, Windows 2000 and Windows Me. My Mac OS is 8.5 and I can’t install the Lexar Firewire Reader? Make sure the Mac OS is 9.0 or greater and the Apple FireWire Software is 2.4 or greater. If you don’t have the 2.4 drivers installed, go to www.apple.com/support and download the driver. Why is memory important to digital cameras? As picture quality and resolutions on digital cameras have improved, the need to save and store larger photo and video files has increased. Earlier versions of digital cameras often featured built-in, non-expandable memory for storing pictures and video. Memory capacity of these cameras could be reached quickly, forcing users to download pictures constantly to their computers or erase pictures before taking another photograph. This is very inconvenient for users who want to use their cameras without having a computer nearby. Today’s leading digital camera manufacturers typically feature removable digital film cards for capturing, storing, and swapping images. Popular removable memory solutions include CompactFlash, Memory Stick, and Secure Digital formats. Typically, camera manufacturers include a minimum-capacity card with the camera, just enough memory to provide a good out-of-the-box experience for the user. As the capacity of that card is reached, either the user must download the photos to a computer, erase pictures, or replace the card to continue taking pictures. That’s why for many typical picture-taking situations like vacations, weddings, or sporting events, the digital photographer needs more digital film. What are the popular types of digital film today? CompactFlash, Memory Stick, and Secure Digital formats. CompactFlash: A small form factor (about the size of a matchbook) that combines non volatile storage, high-capacity options and industry-standard compatibility, which is absolutely essential for digital cameras and handheld computing devices. Because they are designed to the guidelines set by the CompactFlash Association, a base-level assurance of compatibility has been set between all-certified CompactFlash cards and any CompactFlash-compliant device. Memory Stick: Though smaller than a stick of chewing gum, Memory Stick packs big performance and is compact, rugged, reliable, and has erasure prevention. It too has an on-board controller that ensures compatibility with numerous consumer electronic devices. Secure Digital: The size of a postage stamp, SD cards are compact and flexible for use in multiple consumer electronic devices. Its ability to deliver high performance allows consumers to quickly capture photo and video files in a reliable and easy-to-use format. What is the CompactFlash Association? The CompactFlash Association (CFA) was established in 1995, as a non-profit, mutually beneficial industry association. The CFA’s premise is that CompactFlash technology will result in the intro-duction of a new class of advanced, small, lightweight, low-powered mobile products that will significantly increase the productivity and enhance the lifestyle of millions of people. CompactFlash provides the capability to easily transfer all types of digital information and software between a large variety of digital systems. The goals of the CFA are to promote and encourage the worldwide adoption of CompactFlash technology as an open-industry standard. As picture quality and resolutions on digital cameras haveimproved, the need to save and store larger picture and video files has increased. Earlier versions of digital cameras often featured built-in, non-expandable memory for storing pictures. Memory capacity of these cameras could be reached quickly, forcing users to download pictures constantly to their computers or erase pictures before taking another photograph. This is very inconvenient for users who want to use their cameras without having a computer nearby. Today’s leading digital camera manufacturers typically feature removable digital film cards for capturing, storing, and swapping images. Popular removable memory solutions include CompactFlash, Memory Stick, and Secure Digital cards. Typically, camera manufacturers include a minimum-capacity card with the camera, just enough memory to provide a good out-of-the-box experience for the user. As the capacity of one card is reached, either the user must download the photos to a computer, erase pictures, or replace the card to continue taking pictures. That’s why for many typical picture-taking situations like vacations, weddings, or sporting events, the digital photographer needs more digital film. Is performance important when talking about digital film? Yes! While all CompactFlash cards that are certified by the CompactFlash Association should operate in all CFA-compliant devices like digital cameras, some important performance differences can be found in CompactFlash cards used for storage, and those designed specifically as digital film. Lexar CompactFlash and Secure Digital memory cards significantly reduce file transfer time to your computer AND the time a picture file can be written to the card. While actual performance will vary between camera models, Lexar digital film offers high-speed performance so you never miss the memories tht matter: a baby’s smile, a wedding kiss, or any other precious moment. What does 100x, 200x, 400x, and 600x (1x=150KB/s) performance mean? Because digital film performance is so important in capturing the right picture at the right moment, Lexar has implemented an easy-to-understand system to indicate the speed at which the card is capable of storing data. The system is adopted from the CD-ROM industry, in which the performance of CD-ROM drives are rated in “x” increments, where 1x is equal to a sustained write speed capability of 150 kilobytes per second (KB/s). Lexar will continue to introduce faster products with greater “x” ratings, giving consumers an easy way to recognize the latest in high-performance digital film. What does the symbol CF+ represent? This symbol means the CompactFlash card meets the CompactFlash specifications, contains additional USB functionality, and is guaranteed to work in all digital cameras. CF+ is a symbol established by the CompactFlash Association. Access Windows Explorer by holding the Windows key and pressing the letter ‘E’, or search for and run ‘This PC’ in Windows 10 (Computer in Windows 8 and earlier), and right-click on the drive letter corresponding to the flash device. You can leave the settings as-is or select specific values if you need to for specific device and program compatibility. You will receive a message when formatting is complete. Left-click on a file or folder you wish to copy. If copying multiple files, you can hold ‘Ctrl’ and click multiple files, or click-and-drag an outline around a group of files. Right-click the selected file, and select Copy. Navigate to the location you wish to copy a file to, such as another storage device or different folder. Right-click in this location and select Paste. Access Finder by selecting it from the Dock on the OS X desktop. Click on a file or folder you wish to copy. If copying multiple files, you can hold ‘Command’ and click multiple files, or click-and-drag an outline around a group of files. Hold ‘Command’ and press ‘C’ to copy the files to your clipboard. Hold ‘Command’ and press ‘V’ to paste the files from your clipboard to the new location. If a storage device is malfunctioning regardless of what hardware or interfaces it is connected to, most common issues are caused by improperly removing the storage device from your computer or its card reader, corruption, an improper drive letter assignment, or a driver error. With the device connected, right-click the bottom-left corner (or Start button) on the desktop to open a Quick Access Menu, and then choose Device Management. In Windows 7 and earlier, open your start menu and search for Device Manager, then select it. – If the device is listed, check whether there is a yellow exclamatory mark (!) or a question mark (?) next to it. If there is no yellow (?) or (!) mark on the Lexar storage device then you need to confirm/change the drive letter for the memory card/JumpDrive. You must have administrator privileges for your local computer in order to change drive letters under Windows. – At this point it will appear your screen is divided into two separate areas. Please maximize the screen and focus on the bottom portion. You will see a listing that says something similar to the following. “Disk 0, Healthy, Primary, Active Partition.” – this will be your Hard Drive. You will also see any other drives you may have listed here, such as Recovery Drives, any External Hard Drives and your CD/DVD Drives. – Please check for any other Disk Numbers. For example, your memory card or Jumpdrive may show up as Disk 1, Removable. It will also list a capacity close to your memory card, for example a 4GB memory card should show around 3.7GB. – If the device is still not listed or it states “No Media”, the device’s controller or its connection to your system is malfunctioning. Try the storage device in another system or port, but if that does not help please contact us for further support. If it shows as unallocated, your partition has been damaged, and needs to be reformatted to continue using the device. If none of the above resolves your malfunction, please contact us for additional support. In “Volume” select “DOS format” then “Erase”. You will then be able to see the device, unnamed, on the desktop. What are the file systems FAT32, NTFS, ExFAT, and Extended Journaled? FAT32 – 4GB (gigabyte) maximum file size and maximum storage device size can be as low as 2TB (terabytes). Compatible with both Mac and Windows. Typically used for legacy Operating Systems and older devices. ExFAT – A newer iteration of FAT32, requiring newer devices and operating systems, but effectively removing the file size limits and device size limits (ExFAT supports hundreds or thousands of terabytes). NTFS – Windows-specific, though has limited support in OS X. Typically used on an fixed hard drive, rather than removable storage. Like ExFAT, has less restrictive file size limitations, but due to it’s status as a primarily Windows-based file system, NTFS can conflict with non-PC hardware. Extended Journaled – Mostly Apple-specific when dealing with consumer products, and has limited support outside OS X/iOS platforms. Typically used as an Apple OS drive, with removable storage being formatted as FAT32/ExFAT instead. For best compatibility and interoperability of your Lexar storage product across multiple devices (especially non-PC devices, such as media readers built into TVs, Blu-Ray players, DVRs, etc. 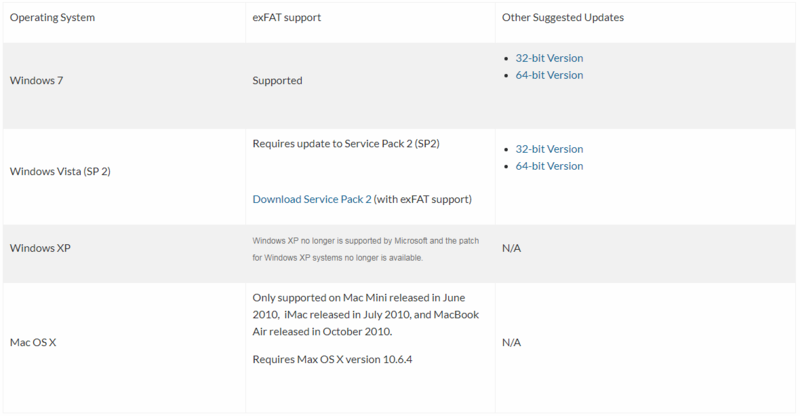 ), we recommend formatting your device as ExFAT or FAT32. Specific hardware may require other file systems, however, including ones not listed here. For more information on a given device’s needs, please see your device’s documentation or manufacturer support for more details.